Comet 011184A - "Orange" garter spring kit for Comet 20 or 30 Series centrifugal clutches. 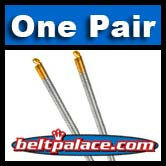 Home > Comet Clutches and Parts > Comet 216115A, 2-Pack of “Blue/Silver” Garter Springs. Comet 20/30 Series (Jr. Dragster). > Comet 011184A "Orange" spring kit for centrifugal clutch. 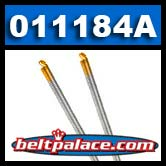 Comet 011184A "Orange" garter spring kit for centrifugal clutch. 1500 RPM with Zinc (Stock) 320g Weight Kit #202933A. 2300 RPM with Aluminum (Optional, Die-Cast) 146.8g Weight Kit #202931A. Genuine Comet Industries parts. Made in USA!